Nothing beats the hot weather and provides exercise better than a swim! Our 8-lane, 25-meter main pool  is one of the largest outdoor private club pools in the immediate area -provides plenty of room for all. For serious swimmers, we have two permanent lap lanes. 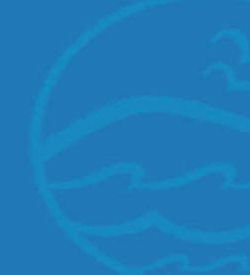 Our main pool has a large diving well with two diving boards. For our non-swimmers and developing swimmers, our main pool also has a large shallow area and we have a secure kiddie pool for the little ones. There are plenty of deck chairs and chaise lounges on our 8,200 sq. ft. deck for just soaking up the sun. Our wading pool, which is adjacent to the club house, is home to our "swimmers-to-be" and their parents or caregivers. 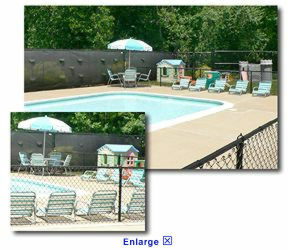 For added protection, it is fenced-off from our main pool and main deck. There is plenty of deck furniture on the wading pool deck and a canopy for plenty of shade. Just outside the wading pool fence is a grassy area with Little Tikes play equipment. It's summertime, and the living is easy - at least at Rolling Hills. When not swimming or relaxing on the pool decks, our guests and members can adjourn to our large grassy area, where we have plenty of chairs and tables with umbrellas. The Club also provides gas grills for those who wish to picnic. 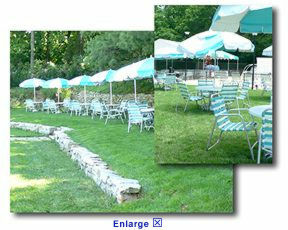 The patio and pavilion area can be reserved for your private functions. Social activities happen all summer long to make lasting friendships. One of the most striking features of the pool is our clear, clear water. How do we do it? 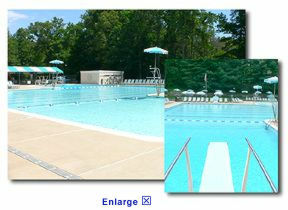 Our DE filter is the main reason why our pool is so clear. 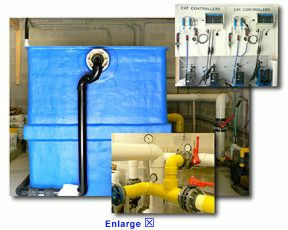 The water in both our main pool and our wading pool is re-circulated through large pipes (see lower inset) 24/7; and the water chemistry in both pools is always perfect because it is maintained 24/7 by CAT2000 computers (see upper inset) that are regularly monitored. All of our pumping and filtration equipment are safely contained in our pump house.